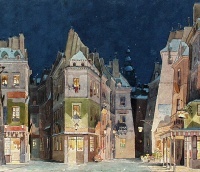 A Paris street - set design for Act II of Puccini's La bohème by Adolfo Hohenstein. An urban area is an area with an increased density of human-created structures in comparison to the areas surrounding it. Urban areas may be cities, towns or conurbations, but the term is not commonly extended to rural settlements such as villages and hamlets. 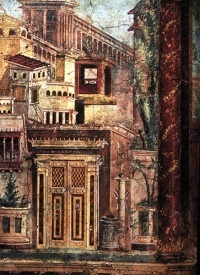 Urban areas are created and further developed by the process of urbanization. Measuring the extent of an urban area helps in analyzing population density and urban sprawl, and in determining urban and rural populations (Cubillas 2007). Metropolitan areas tend to be defined using counties or county sized political units as building blocks. Counties tend to be stable political boundaries; economists prefer to work with economic and social statistics based on metropolitan areas. Urbanized areas are a more relevant statistic for determining per capita land usage and densities (Dumlao & Felizmenio 1976). Unless indicated otherwise, the text in this article is either based on Wikipedia article "Urban area" or another language Wikipedia page thereof used under the terms of the GNU Free Documentation License; or on original research by Jahsonic and friends. See Art and Popular Culture's copyright notice. This page was last modified 21:10, 15 December 2014.